Hello, there health coaches. How are you doing? Today we are talking about how to set up online programs. Yes, big topic and this is something I’ve done so many times through the years. Lots and lots of different ways. Today I’m going to share three different techniques that you can use. They range from free and easy to a bit more complex. My name is Michelle Pfennighaus. I’m a certified health coach. I have my own private practice and I also act as a mentor for my fellow health coaches and I’ve been doing this for a decade. If you’re watching as we live stream, first of all, you can see that I’m wearing the most color that I could possibly pull out of my closet because it’s such a gray, yucky day, so thumbs up if you like to put some color in your day, but also go ahead and give it a thumbs up if this is a topic that you definitely want to learn more about and tell me in the comments, have you ever run an online program before of any kind, and if you have, how did you do it? We would love to hear your techniques as well. Now today’s episode is brought to you by my free training for health coaches, how to double your mailing list in the next 90 days. If you plan to sell an online course, you’re going to need, need, need, need, need a healthy mailing list. So, this training is for you and you can sign up for free at healthcoachpower.com/double. Okay, so our big question of the day came from Cara and Cara said I’m in the process of building my website and I wondered two things, if you’re taking payments online, what service are you using to collect payments and recurring payments and if you host an online course, what platform are you using to design the course? So, both really useful questions and um, and I want to just tackle all of that because my goodness, Cara, you’re not the only one with these challenges and with these questions. So like I said, there are really three different ways that I have run an online course. And that I would suggest you think about it in, in these sort of three categories. The first category is keeping it very, very simple, really, like it’s just the most basic thing you can do the least technology you can use considering it as an online course. And um, if you’re in that the first stage, maybe your first course, all you really need to collect money is either a PayPal button or a PayPal invoice. I mean, you can invoice just like you would for a private client. You can invoice each individual separately and have them pay to join your course, right? It doesn’t always have to be the fancy buy now button with the fancy confirmation message that comes automatically. You can do it almost like you’re signing a bunch of one on one clients, so either use an invoice or um, you can create a PayPal button pretty easily on PayPal. Um, and, and they just give you a little snippet of code that you can I please onto a webpage or even into an email. People Click on that, they pay the money and then you just kind of handle it manually from there. So in terms of payment, that would be sort of the easiest way to go. I suppose the really low tech way to go, it’d be to have somebody write you a check, but I’m assuming we’re not operating in that ballpark right now and then you can either email all of the course materials to your participants, you can just have a pdf that you attach to an email and send it out (that’s really simple), or you can upload files to a Facebook group. So, a lot of times courses have a Facebook group associated with them. Almost all courses do. Let’s face it, and I love that Facebook has a file section inside of their groups so you can upload files and they can just live there. The only thing to know about is that all of your members have access and all of your members can accidentally delete what you have put up on the site, so just keep an eye on it and ask that nobody messes with the file section because I have had that happen where somebody has uploaded their own file and deleted what I had. So you just want to keep an eye on that. But anyway, all of those options are 100 percent free and doesn’t take a whole lot of learning. No big technology learning curve if you’re going to use that that way. So let’s, um, let’s move on to the next sort of step up. So if you’re going to formalize things a little bit more and maybe you have more stuff, maybe you don’t, not just giving everybody in your online program a pdf, maybe you have some videos, maybe you want them to complete a form before they participate in your program or during the program. Um, there’s just like a few more moving parts than you may want to get yourself onto some sort of automated platform. But that doesn’t mean that you have to spend like $99 a month for a true members site. So there is a middle of the road option that I want to tell you about. If you haven’t already heard me talk about practice better. Well I’m going to talk about it now because I feel like practice better is a really good in between option. So first of all, it’s a pretty inexpensive tool and it handles everything from payments, including payment plans. You can put together any sort of payment structure that you want and I’m on your whole online course management, but not just that. It will also manage all your private clients as well, so you can use it for so many things. The scheduling that you do with your clients, it’s all handled on the practice better platform. So it’s a really good investment and you’re not just paying for it for the online course, I guess is my point. I’m so this is a nice option because it is a one stop shop. Practice better is going to allow you to set up your course, put all of the content right there into the platform. Your members will sign up on a practice better page, you know, you’ll send them to a link and they can sign up right there. They can pay right there, they can choose their payment method if they’re going to do a payment plan, pay in full whatever. And um, and it’s all housed in one place. They log in, they get access to everything, you log in, you get access to everything you need to do and nobody can accidentally mess up your files. The other nice thing is that if you’re emailing your files, if you’re emailing materials to your course participants or even if you’re emailing information like about when you’re going to be doing a live call and the access information for that call emails get lost, so it’s nice to have this one place where everybody can log in and get everything they need and it’s always there. So when you have more participants in your programs, I think it becomes more and more important to head off all the. I lost my email, I lost the pdf. Where was this? Where was that? Because you spend a lot of time answering those types of questions, but if you have everything in one place, everybody knows they can go there and get everything they need. So do look into practice better because like I said, it’s only about $35 a month in US dollars and it’s a Canadian product. So that’s why I say in US dollars. It’s only about $35 a month and it’s going to manage your whole business and allow you to do group programs as well. So great middle of the road option. And then finally, let’s talk about the big boy. We’re talking about a course that has lots of materials, lots of different types of materials, many modules. The kind of course that you’re always selling. You’re always adding members to not something you’re just doing one time for five days and then it’s over. You know what I mean? So for larger scale courses, I’m currently using Thinkific for my Healthy Profit University course. It handles all payments, all payment plans has a very modern, easy to use design. I liked that very much. It allows me to add video quizzes, you know, obviously tax, but like any sort of materials and there’s lots of different features that you can put in there for your online course. You can bundle two courses and sell them together. They have an affiliate platform if you want to offer people to be an affiliate for your program. So it’s just like bigger, you know what I mean? So there’s no need to pay for that if you’re just starting out and just going to have a few people, but if you are scaling up or you’re looking to create that big signature course, it’s going to be around for a long time. That would be the appropriate time, I think to start looking into investing into a true member site. So, so far I really like using Thinkific. We’ve been on it for about a month or two now and it’s been nice. It’s been nice. I really, I like it. They have good customer support. They get back to within a day, you know, there are other sites out there that you can look into, like teachable. What are the other ones? Udemy. Is that how you say that? Udemy? There’s a bunch of them out there. We chose thinkific. Now, of course, before you decide on what technology you’re going to be using to present your course, you should come up with the content or at least the outline for the content. What are you going to teach your students? And the more specific you are, the better. Because teaching people like in general how to be healthy in general is too big. It’s too broad, it won’t sell, I promise you that right off the bat, and even if it did, it would be too hard to help all sorts of people with all different health problems, right? So instead you want to focus on a specific type of person and figure out what one big problem you’re going to help them solve with your course. Like what’s the promise of the course. For example, you could do an online program that helps menopausal women get rid of hot flashes, right? That’ll sell like hotcakes, no pun intended, so know who you’re serving. No a big problem you’re helping them solve. That’s really going to help you hone in on what materials should be in your course and what material doesn’t belong in your course. A big downfall with online courses is sometimes too much, too much stuff. Do you want to pair it down to exactly what you need to help get your perfect client from point a to point B, and I’ve got one more note on online courses and then of course if you guys have any questions, go ahead. If you’re with me as we live stream, put those in the comments section now and I will answer those in just a moment, but over the past few years there’s really been a trend that I’ve noticed. I think a lot of people are noticing where folks are a little bit over the online course. I know sounds a little strange, especially since we’re here to talk about setting up your online course, but folks don’t want to purchase a course to do on their own by themselves. It sounds good like DIY, do it yourself, but in reality, everyone by now has probably purchased something like this and they didn’t actually complete the course. I know I’ve done that. So I also think that in general, like what’s going on in our culture right now is that we’re starved for connection. People are just literally looking to connect above anything else. So while you can give them a course that they do by themselves and it has technically all the information that they need, people want that personal touch. So the more personal support, the more group support you could offer as part of your program, like the more you can really be involved with your participant’s, the better. Inside my online course, healthy profit university, I help health coaches earn a full-time salary. That’s the big problem that I helped them solve, right? Specific and within that we do live group calls. So that’s one way where you can provide personal support without actually getting on the phone individually with everyone. You can have group calls. We also have a very active Facebook group and the option for private sessions. So I want to encourage you to not create a program and set it and forget it over here in the corner, but actually be very involved with your course participants so that they get the support they need and have a great experience. Then they give a great testimonial and you make more sales. So this is how you really make it worthwhile. Sharon’s asking would you count a five-day detox as having run a course? Yes, I would. Unless your whole detox is done in person. So if you’re meeting with your group in person, solely a, everyone in your group is local, you know, then it wouldn’t be considered an online course, but more of a local in person group program. But I think most health coaches I see running a detox, particularly the five day detox that everyone is doing is um, you know, you’re doing some sort of zoom meeting on the first day. So then it becomes a question of like, well, you know, where do you keep the recording from your zoom meeting and where do you put the pdfs that you give your participants? So like I said, you could be emailing it to them and you could be directing them to a Facebook group or if you have a large group, it may make a lot of sense to upgrade and use practice better as a platform. 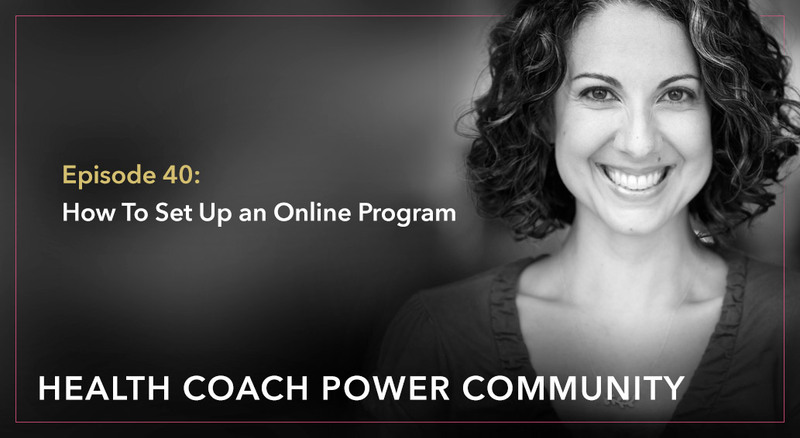 Jasmine says, what is the maximum number of people to enroll in an online group coaching program? I’m thinking 12 and I’m not sure if that’s too many, you know, it really depends how it’s structured. So for example, with healthy profit university we have way over 100 members, about 150 – 160 members right now and it could double, it could triple or quadruple. It doesn’t matter. The course is set up to be entirely scalable, which means not the work that I would put into it would be approximately the same even if we had many more students. So that’s one setup. But recently I held a sort of a one off course and some of you guys are familiar with this who were inside healthy profit university. It was called fast track to $500. So we actually did like a group course within a group course and it was members of HPU who got together and we’ve been doing weekly live meetings for the past several months and every student was submitting homework that I’m reviewing and giving feedback on. So it was a lot more calls and you can’t get to everybody if there’s 100 people in the group, you could never get to everybody inside of a one hour, even at two hour call and certainly can’t review all that much homework if there were, you know, like 100 people in the group. So in that case the group has to be smaller. So Jasmine, to answer your questions, it just depends on how you anticipate interacting with your students, clients and what sort of support you’re going to be giving. Is it something where you need to cap it so that everybody gets the support that they need? What else do we have here? Taylor says, I’m trying to find ideas for how to utilize the new year’s enthusiasm for setting resolutions and getting healthy again. Any ideas or offerings outside of online programs that you have? Well, if you don’t want to do an online, I mean literally anything that you do with your health coaching business, January is a great time to sell the heck out of it because people are motivated and have noticed that if you start talking about it in the beginning of January, that’s great if you actually sell it and begin whatever it is, the program, the coaching package towards the end of January is better because people are so wiped after the holidays, financially just energetically wiped. They usually are not paying a lot of attention in that first week or two of the month, but towards the end of January they’re coming around and will really hop into a program. So if you’re going to run a detox, if you’re going to run a, whatever it is, don’t start it on January second. That’s my best advice to you, but it really is high season for health coaching, so no matter what you’re selling, this goes for everybody. Mark your calendars for January and early February. Then again in like late March and April, and then again for late September and October. Those are the hot spots throughout the year. Alrighty, so we have a couple other questions that we’re going to get to today. If those of you watching live want to ask anything else, go ahead and feel free. I will come to you. Our next question comes from Kelly. She said our local yoga instructor approached me and asked if I would like to run a workshop or something through her studio. She’s very Godessy if that makes sense. What workshops or events have you run through a yoga studio? I was thinking of something about hormones tied in with lunar or something, but I have no idea how or where to start. Never done a workshop before looking for suggestions. So, Kelly, this made me laugh because clearly this woman is a little more as you put it Godessy than you are, I’m guessing based on how you wrote this and that’s, that’s totally fine. It doesn’t mean that everything that happens in her studio has to revolve around, you know, crystals and then woo woo smudge sticks and whatnot. You know, you can really go get in there and speak to her students about other topics and I would encourage you to do so. I bet not all of her students, you know, just want to hear about the moon and the lunar something so open your mind. Don’t, don’t feel too caged in by that. And I want to suggest to everyone like a really great workshop to get yourself familiar with and to get very comfortable doing is a sugar workshop. You know, it’s like the classic, the sugar workshop. You know why? Because you can take the topic of sugar and like Jasmine here, she said she’s going to be running this 90 day diabetes program. Great. So if you have a diabetes population, perfect topic. What if you have a population who needs more energy, perfect thing to talk to them about their sugar addiction. Um, what if you have people with digestive problems talk to them about the sugar in their diet. Like it almost doesn’t matter what somebody’s health issue is or what they want to achieve in their life. Literally everybody will be helped by kicking their sugar addiction. And most people know that they have a little too much of a sweet tooth, so they’re aware of that problem. It’s not so personal like when you’re talking about, I don’t know, depression or even some hormonal topics or some topics are very deeply personal and hard for people to show up in a group setting to talk about it. But sugar people feel really comfortable talking about that and laughing about and kind of coming together to talk about what their favorite sweet treats are. So think about that everyone as the first workshop that you do had a lot of success with the sugar topic and then you would just tweak it based on your audience. So if you have a lot of women, let’s say it is this really Godessy yoga studio. It’s a lot of women who were like super spiritual place. You could talk about how eliminating sugar from your diet, you know, opens you up, like opens the channels to really connect better with the universe. Because it does, right? Like when you’re on sugar, you’re not thinking straight. Your cravings are in control of you instead of the other way around. So you can frame the sugar topic however you need to make sense with a given audience. The other thing I have for you, and I’m going to put a link into the comments right now is um, I have a free workshop blueprint. It’s actually, it’s a blueprint that you can use with any topic for your workshop, Kelly, but I’ve used a lot for my sugar workshops and it’s just going to walk you through exactly what to do almost minute by minute inside of a one hour workshop like the one you’re talking about. So go ahead and grab that. That’s going to help you know exactly what you’re doing so you feel more confident walking into this opportunity. All right? And then we have a question here from Alexandra and she says, I graduated last year and I’m struggling to start the business and get clients. Well, you’re in good company friend, because I would imagine that almost every health coach watching or listening to this episode is going to raise a hand and say, yeah, me too. Or Yeah, I’ve been there now, so I’m going to actually just harking back to what we were talking about a moment ago about holding workshops. Those are really great place to start, Alexandra, because it is a one time commitment. You show up, you give the workshop, maybe it goes great, maybe it doesn’t go so great and then it’s over and then you can post game and figure out what you might like to do better the next time. It’s just a good, good starting point to get your feet wet, put you in the position of expert in front of a group, a group of people. Maybe it’s just five people, maybe it’s 20 people, but we’re not talking about, you know, a room full of a thousand people watching you workups are excellent for that. So Alexandra, again, pickup that workshop outline. I think that would be helpful. Start wrapping your head around how you might put something like that together. Also, I’m in episode 38, so if you go back in the archives episode 38, we talked about how to get your first clients. Then we went into detail about doing sort of a friends and family or intro package, so you can get details about that in episode 38 and then if you go back to episode 25, we talked about how to launch your business. So, there’s all these how to’s and specifics, but in addition to that I just want to add how are you sort of taking steps to treat your business like a business? Like do you have dedicated space to work, to have dedicated time to work? Have you defined a target market? You know there’s just certain important pieces of groundwork or like a foundation that I find a lot of coaches are missing and we go from getting certified to Oh my God, why don’t I have all these clients, but any good business has a bit of a business plan. I’m not saying you have to be super formal about it, but you should at least like for me, getting child care was super important. Without childcare I can get nothing done. I would never get anything done. I’d be trying to work in bits and bots like in between taking care of kids and making dinner and wiping butts. Lisa is saying, what about workshops online if you don’t live where you have ideal clients? That’s a really good question, Lisa. So an online workshop would really be a Webinar, right? And that’s fine. The difficult part with a Webinar is getting an audience and the reason you’re even hosting a workshop in the first place is because you want to get yourself in front of new people, add new names to your mailing list. And that’s great if you’re partnering with a Yoga Studio because they have the people, you come in with your expertise and they give you the audience, right? That’s, that’s an ideal situation when you’re hosting a Webinar, it’s a little bit harder. It’s almost like if you were going to host a workshop in your own house because then it’s up to you to bring all the participants there and a lot of them will be people that you already know, in which case you’re not really growing your mailing list. So my suggestion would be that you treat an online workshop almost like you would treat an in person workshop where you go find a venue, you go find a group that already exists and make a connection with whoever runs that group and then bring your content to that existing group. I can’t tell you how many coaches get all excited and they hold their first Webinar, but it’s like three people sign up. Of course. I mean that’s why we’re doing all these exercises to grow your mailing list so that eventually you can host your own events and your audience will be big enough that you’ll fill your own events. Especially when you’re first starting out. You need to get in front of a new group of eyes. So, I would maybe find a, um, you could find a Facebook group where everyone in the Facebook group is in your target market that would be so perfect and then contact the Admin of that group. Maybe you can do a Facebook live into their group for their members. That would be a great way to hold a workshop for a group of people who are not in your location. Okay. I hope that helps. Um, let’s see. This question is from Melissa. Melissa says, I have someone who just wants some guidance on nutrition, not specific diet plans because he has tried everything he can think of. I put it across very clearly that this is outside of my job scope to give specific nutrition prescription and he understands that, but I’d like to pay for my health anyway. Does anyone here provide only nutritional guidance? And if so, how much should I charge for it with consideration that I’m only looking at spending maximum 30 minutes of my time on this. Melissa, I’m just going to go ahead and say it. I don’t think this person is the right client for you and it’s okay. That totally happens. Sometimes people come across your path and they’re looking for a and you’ve got B and it’s okay if it’s not a match. Even if they want to hire you, you do not need to accept them as a client. It sounds like maybe a this person is just looking for a real specific like, I don’t know, tell me what to eat. I get this a lot too. People come to me thinking nutrition. They think I’m just going to give them a meal plan to follow or a nutrition plan and I’m like, well, it’s not exactly what I do. If they’re into that, great. If they’re willing to take a more holistic approach to their health and dive into some deeper topics, great. If not, send him on his way because he’s probably looking for somebody else and this is important because when we start taking on clients that are not a good fit for us, it’s like, you know, round peg, square hole takes effort. It always feels weird. It takes too much energy to figure out like even you, you’re posting this and thinking about it and in the end you only want to spend 30 minutes with the guy. You got better things to do. Melissa, tell him to find somebody else to work with. All right. I had like one more minute. So let’s see if we have another question. In which case I will be happy to answer it. I have one here from Ashley. She said, do you guys have, speaking to all of us collectively as health coaches, do you guys have physical building space, do telephone visits or use a platform such as zoom or skype most of the time? So actually, I think you’re probably talking about private coaching in particular. So I’m going to speak about how I do private coaching. I actually have done all of those things in the past and I’m happy to report that these days. I do all of my coaching by phone exclusively. I have never rented space. I don’t love the idea of having the overhead costs of rented space. And I noticed that if you try to do zoom or skype with the client, people can be a little self conscious about being on video and you’re just kind of there staring at each other’s face really intensely. Whereas in person, if you’re meeting in person, you’re not really staring like up the person’s nose the whole time. It’s a lot more casual. You’re looking around, you’re crossing your legs and you’re more relaxed. But I found when I do sessions over zoom, I don’t like it. I don’t think the client is as relaxed and the conversation doesn’t flow as easily. So for me, telephone is perfect. It’s much easier for folks so that they can do it from anywhere. And He fell in line, no technology involved. And I think people are a lot more relaxed. Nobody’s seeing their face. Um, maybe they’re sitting, maybe they’re lying on the bed. Heck, sometimes I’m lying on the bed. But the point is we’re both in the space where we can focus and, and have the conversation that needs to take place. So everybody does it differently. But for me, I’m all about the phone. Alright you guys. Thank you so, so very much for joining me today. Please take a minute, leave a review on iTunes for the Health Coach Power Community Podcast. I would appreciate that so very much. There’s a link in the notes next to this video or next to this recording, however you’re listening and I will see you next week. Keep asking great questions and I’ll keep answering them. Take care.